The chalet is situated at the entrance of the village up the hill in an area called Petit Village and can be accessed via a private funicular railway through the mountain where you can drive to by car in order to drop off your luggage. When traveling by train it's easiest to just grab a taxi at the train station and enjoy the ride. This free standing property is set into the mountainside with a magnificent view of the soaring Matterhorn. It offers a comfortable contemporary feel using a combination of local materials, natural fabrics and simple elegant lines. 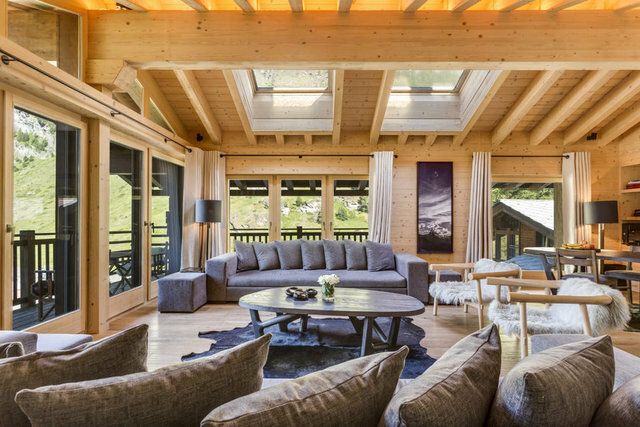 Chalet Maurice is filled with sumptuous fabrics and rich wood in palates of charcoal grey, cream and white, all combining to form a luxurious and chic alpine retreat. The spacious open plan living area and dining room create a feeling of comfort and light. Large south-facing balconies on each floor, offer the perfect spot to sunbathe and soak up the breathtaking views. The chalet sleeps twelve guests in six large ensuite bedrooms spread over three floors serviced by elevator. Four of the bedrooms have direct Matterhorn views and the master suite is spread over the entire top floor, featuring an open fire, a double height pitched ceiling and floor to ceiling windows. The ground floor features a small wellness area with a sauna, a massage room and an outdoor jacuzzi.